Before sailing offshore, racing, cruising, or power, departure checklists require full attention. Getting spare parts, provisions, ship and crew papers, setting up mail service — everything takes time. Setting up a boat website may be on your list, but where to start? It’s lower priority than getting the liferaft serviced, or arranging your yacht insurance. We did some homework on this topic. First we give you some insight about how websites work today. Then we present website options for cruisers to consider. A book could be written on this topic, but read on for the condensed version. Website semantics require some explanation. Blog is both a verb and a noun. You can blog (verb) on your own free blog (noun) today, thirty minutes from now! In the 1990s, websites were comprised of static pages, written one page at a time. Today, websites often contain both static page and dynamic post content. In simplest terms, your browser displays a website one page at a time whether you’re reading pages or posts. That implies that posts, too, are displayed on pages. Pages and posts can look similar, if not identical, so how are they different? You use them in different circumstances and the site displays them in different ways. You use pages for static content, or information which does not often change. This site’s contact page is an example of a page. You might devote a page of your site to your boat’s specifications. Navigation menus enable easy access to pages with a single click. Pages can be organized in a hierarchy; posts cannot. If you mouse over the My Account page navigation button, above, you will see other pages which are sub–pages of your My Account page. While a page may have only subtle differences in appearance from a post, or no difference at all, the biggest difference between posts and pages is how your website platform handles them. Think of posts as articles you publish about your adventures. Your website will display these articles in several places on your site. First, they appear on a dynamic main aggregating page, which commonly displays only the opening lines or paragraphs of each post. You don't physically add these story openings to that aggregating page; your website platform handles that for you, dynamically. You determine how much of the story will show up on that main page by where you add a special tag in your post. Whereas your site’s page content will probably not fall into a clear timeline, story openings of your posts are usually displayed in chronological order. This helps readers conceptualize where stories fall on the timeline of your voyage and it helps them locate and easily return to stories they want to reread. Second, each post, in its entirety, appears on its own page. A post that is very long can be paginated into successive pages if you like. That has been done with this article. Third, a filtered selection of posts will be displayed when a reader clicks on a tag or category hyperlink. Posts, you see, unlike pages, can be labeled with tags and categories to organize your writings. In WordPress, the writer inserts a <!--more--> tag into the story to create both a section break and a read more link. The aggregating page can present each entire article you publish, but usually writers show on that page only story openings for easy perusal. On this site, that aggregating page is named, News. You could name yours, Blog, or, Updates, or whatever you prefer. The content of that aggregating page is created dynamically. In other words, story openings appear there automatically once you publish a story. Readers comb through the story openings on that aggregating page. When a reader finds a story he wants to explore further, he clicks that story’s read more link (or the story title) to find the rest of that story, on its own page(s). If he’s not interested in some content, he may scroll by it on that aggregating page. Sites such as this represent an evolutionary step in website technology. They make posting articles easy, and enable quick scanning of content by perusing opening paragraphs. If you create a tag called anchorages and use it to label your posts about anchorages, readers researching anchorages can click your tag to find your other articles about anchorages. Finally, these sites also permit readers to comment on your stories, and writers to reply to comments, making such sites not only dynamic but also interactive. Except for SailBlogs, which enables only posts, the site options described here let you create both pages and posts. No special software is required to manage a blog; it can be done online via browser. In other words, the same software you are using to read this is all you will need; some platforms even let you post by email…even by SailMail. Just as having a genoa and a drifter as well as a working jib enhances your sailing, so can familiarity with image editing software and web-authoring software enhance your blog. But this extra software is not required. That’s good because learning your way around that extra software is way tougher than knowing when to fly the genoa instead of the working jib. Buy a copy from Amazon of HTML for Dummies if you want a handy reference. If you are online, here is a primer on creating content on the web. You can host your own blog on your own domain, as Dorade does on dorade.org, or you can pursue a simpler option. You might decide that an off-the-shelf free blog, from Blogger.com, Posterous.com, SailBlogs.com, TripSailor.com, Weebly, Wix (almost free), or WordPress.com, meets your needs. Don’t stress, we describe these options below, with key features, to help you decide what will work for you. Complete management of your site by email is not possible. You will need occasional Internet access to approve or reply to comments, post photos, update software, or edit content you have already posted. Nevertheless, even without Internet access, you can keep your readers updated if you select an option that allows posts by email. To post by email, you need a laptop computer and either any kind of Internet connection or your Pactor modem and service. Possible connections include not only dial–up access, Wi–Fi, an Internet café, pre–paid cellular, but also SailMail or AirMail (free to ham radio licensees). WordPress enables you to post an entry by email to a secret email address, as does Blogger (click to instructions). You can also post by email, for a fee, to SailBlogs (click to instructions). 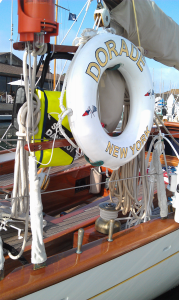 With a working SailMail installation on your boat, you can post from anywhere. SailMail even includes a SailBlogs template! Note that SailMail recommends sending text-only email. You can add images later, from an Internet café, or by Wi-Fi, once you make landfall. Posting by email means you do not need to be able to browse the Internet with a browser; you just need to be able to transmit an email, by whatever means. How low do you want to go? From free to fee, you have lots of choices when it comes to setting up your cruising blog. In general terms, if you pay more, you get more. How much do you need? Click to the next page to read about the options. This entry was posted in Cruising by Philip Thompson. Bookmark the permalink.